A wide array of phenomena can be measured using FRET, and they tend to fall into either of two main categories: 1) homogeneous in vitro assays performed in a spectro-fluorimeter or microplate reader and 2) live cell FRET imaging performed by fluorescence microscopy. The basic requirements for the detection of FRET in these two domains are the same: 1) a light source for donor excitation; 2) wavelength filters to spectrally separate excitation photons (originating from the light source) from emission photons originating from both D and A; 3) detectors that can separately register emission photons from D and A as two electrical signals (spectrofluorime-ter) or as two digital images (fluorescence microscopy). Fig. 3 Types of molecular interactions measured by FRET. A) Binding of two molecular entities X and Y, respectively labeled with donor D and acceptor A results in FRET (ET). B) Cleavage of D- and A-labeled peptide or nucleic acid sequence via protease or endonuclease results in decrease in the FRET signal. C) Fusion of liposomes containing a high concentration of D- and A-labeled phospholipids with unlabeled liposomes results in dilution of D and A and decrease of FRET in the newly fused membrane. D) Molecular beacons oligonu-cleotide probes adopt a stem and loop structure in the absence of a perfectly matching target DNA sequence, resulting in FRET between donor D and nonfluorescent acceptor Q (quencher). Perfect match results in hybridization of loop sequence to the target DNA and increased separation of D from Q.
Peptides containing a specific protease cleavage site, and labeled with D and A at either termini, can serve as FRET sensors. Fluorescence resonance energy transfer occurs in the intact peptide but incubation with the protease separates D from A causing a decrease in the FRET signal (Fig. 3B). 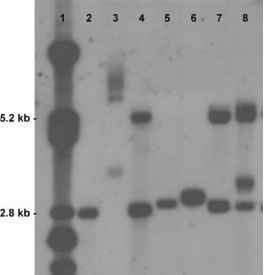 The activity of endonucleases can similarly be detected using a dual-labeled nucleic acid sequence. Membrane fusion assays can also be performed using FRET, by incorporating phospholipids labeled with D and A moieties into liposomes at relatively high concentrations.1-5-1 Because of molecular proximity, D and A undergo FRET in this liposome population. Fusion of such liposomes with unlabeled liposomes creates larger liposomes in which FRET is decreased due to the increase in average distance between labeled probes via dilution (Fig. 3C). Molecular beacons are FRET probes that can adopt one of two very different conformations depending on the presence of specific target DNA sequences in a sample (described in more detail elsewhere in this volume, see also Refs. and ). The technique is so sensitive that it can resolve single-base pair mismatches. In the absence of a perfectly matching sequence, the molecular beacon adopts a hairpin-like structure (Fig. 3D) which brings the donor- and acceptor-labeled ends of the molecule into close proximity. The acceptor is a quencher (Q) in these probes, therefore very little fluorescence is emitted by the probes in this conformation. In the presence of the exact match, the stem structure opens up, allowing the loop to hybridize to the perfectly matched target and increasing the distance between D and Q. These are just a few illustrations of diagnostic in vitro assays performed using FRET probes. They are typically easy to set up and can be automated; some are known as ''walkaway'' assays because no further processing of the sample is required following the initial incubation of reagents. The extent of the reaction (whether binding, cleavage, membrane fusion, or other) can be modulated by adding competitors, agonists, antagonists, or other test compounds, either in purified form or from crude extracts, and their effect on the assay can be measured. The kinetics of any assay can be monitored by collecting the emission from D and A continuously or at timed intervals, without interrupting the reaction. In addition, because D-A pairs can be spectrally quite different from one another, several probes can be monitored simultaneously in the same reaction (multiplexing; see Ref. ). In homogeneous FRET, background noise derived from sample autofluorescence can limit the sensitivity of the technique. Two related techniques extend the sensitivity range of FRET measurements by radically reducing noise in the system. Time-resolved FRET (TR-FRET) uses fluorescence donors with unusually long fluorescence lifetimes (400 nsec to 2 msec for chelates of ruthenium and lanthanides compared to 10 nsec for typical fluorescent molecules). Time-resolved FRET delays the collection of light by the detector, allowing any fluorescence that is not derived from the long lifetime donors in the sample—including noise—to decay to zero. 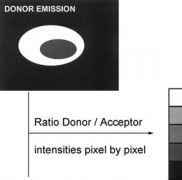 The slower decaying donor-specific fluorescence (or FRET signal) can therefore be measured in the absence of background. Another way to reduce background fluorescence in FRET measurements is by omitting the light source altogether. Bioluminescence RET (BRET) uses a lucifer-ase as a donor which produces light only when the substrate (coelenterazine) is added to the reaction. When bioluminescence is produced in close proximity to the acceptor, energy (not photons) is transferred resulting in an increase in the acceptor fluorescence. As there is no extrinsic illumination to activate sample autofluorescence, BRET can increase the sensitivity of donor-acceptor interactions by an order of magnitude compared to FRET.